There's really only one word to describe today's experience at the Women's Resource Center: AMAZING. The trend here in Atlanta seems to be that when we walk in a room, we immediately feel a sense of welcome and acceptance. Perhaps it's the southern hospitality! Anyway, the safe house facility was super tranquil and felt like home. While most aspects about our experience today must remain confidential, it was really amazing to know that all the little things we could contribute will make the lives of these women that much easier. Whether it was painting bathroom walls, raking up leaves or creating inspirational bulletin boards, none of our efforts will go unnoticed. The workers and interns of the resource center had such kind and radiating spirits that set the tone for the entire day. Being at the Women's Resource Center sparked a conversation for us about possible ways we can begin to prevent domestic violence from happening. We have realized that education is a huge component. It would be helpful to have some programs for young girls, maybe grade school age, that would talk to them and model for them what a healthy relationship is supposed to look like. It should also be sure to highlight some warning signs of abusive and/or controlling behaviors. Speaking up also makes a huge difference. If you see something alarming or know of someone in an unhealthy relationship, you are just as much at fault for not saying anything. Although you cannot force action upon anyone, odds are that they do not know that what they're experiencing is wrong. Start the conversation! In other news, MAB-ATL3 had a couple of firsts tonight! Madie ate Popeye's for the first time. 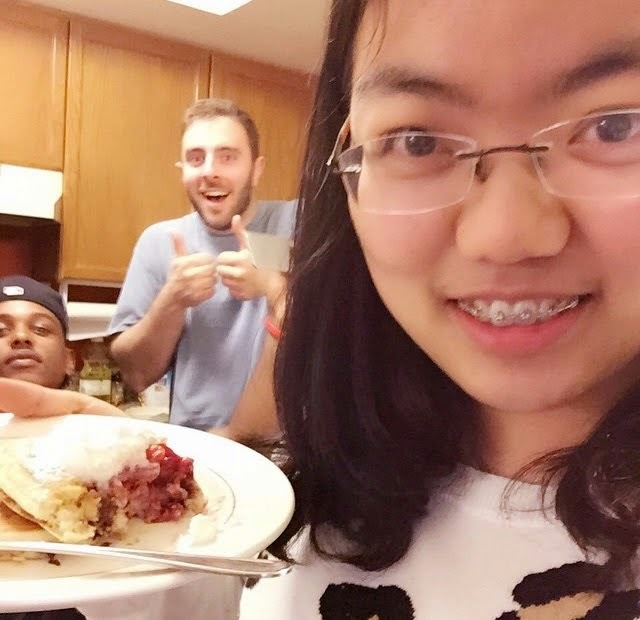 Bonny ate pancakes for the first time AND learned how to whip (thanks to Myles). And we also shared our first kiss stories today which was pretty interesting, LOL! It only gets better as the week goes on.